Weekly Photo Challenge: Ooh, Shiny — UT’s Pride of the Southland Band | Oh, the Places We See . . .
Count me lucky. 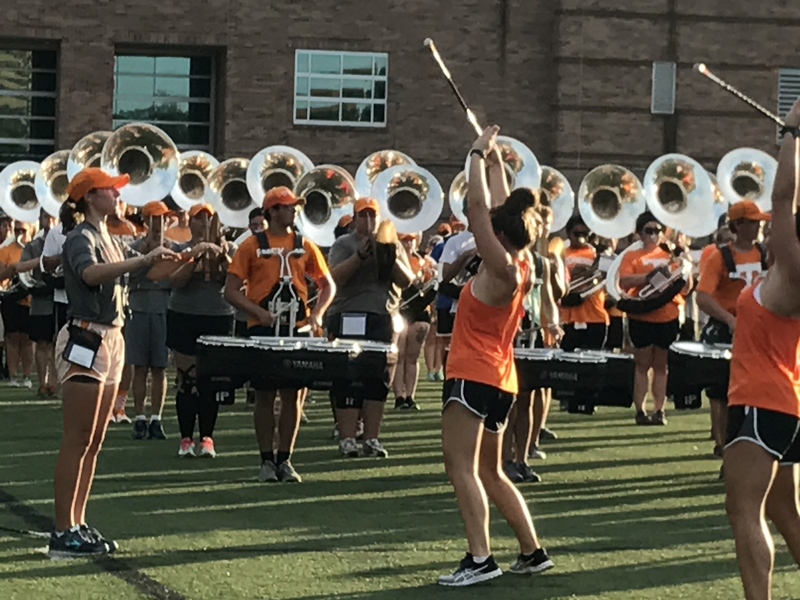 Day 4 of UT’s Band Camp found many alums (including me!) watching as the Pride of the Southland Band practiced its newly- polished maneuvers. Alums stood on the sidelines of a practice field near the Natalie L. Haslam Music Center duly impressed with what a group, together only for four days, could master for pre-game entertainment. More shine as saxophones take to the field. They marched 8 to 5. They played “Rocky Top” and “Star Spangled Banner.” And they sparkled — even in the 90-degree heat. 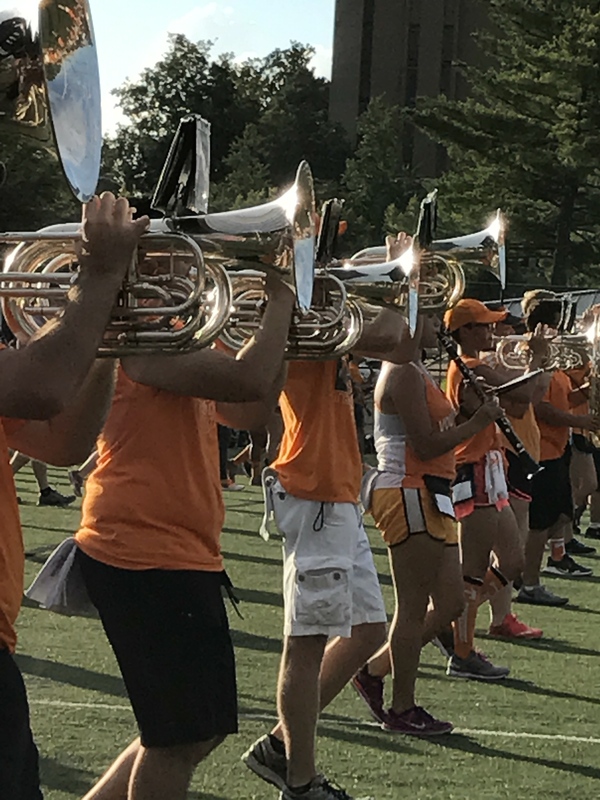 Even if they weren’t perfect yet, they were getting there, thanks to the leadership of Band Director, Dr. Donald Ryder and an emphasis on perfection — from drums and horns to flags and majorettes. If you’re anywhere near Knoxville for the home opener against Indiana State on September 9th, get into Neyland Stadium any way you can. The Pride of the Southland Band will shine on . . . as always. For more posts on the Weekly Photo Challenge: Ooh, Shiny theme, click here. 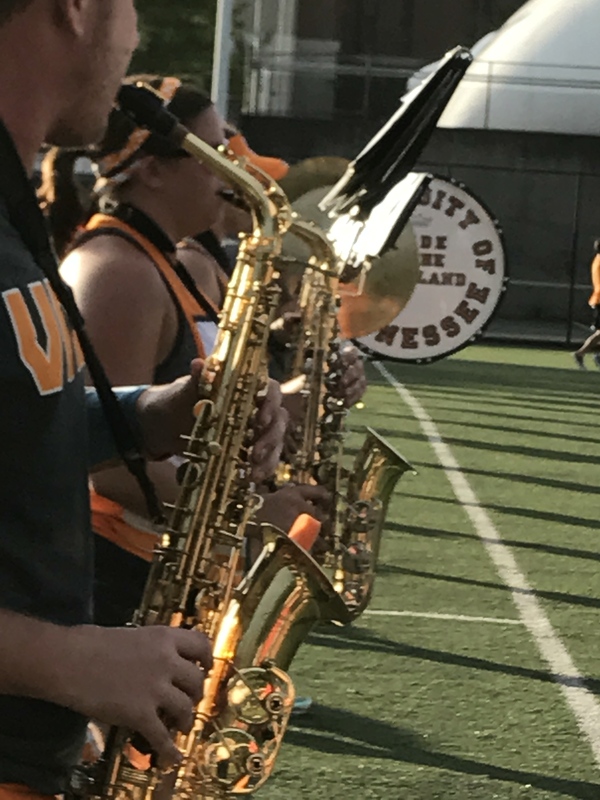 This entry was posted in Photography, Weekly Photo Challenge and tagged Donald Ryder, majorettes, Natalie L. Haslam Music Center, Neyland Stadium, Pride of the Southland Band, Rocky Top. Bookmark the permalink. It’s good times during band season in Big Orange country. And we’ll be hearing them play all fall. Best wishes to you for a great autumn, too. Thanks, Judy. I love seeing students perform, and when they’re playing songs I can sing along with, it’s even better! Love that first shot for the propmpt…shiny…but really loved all of them, as they reminded me of band camp oh so many decades ago. Thanks so much, Dawn. The experience was a warm, fuzzy one — seeing the band play songs that I’ve been listening to for 50 football seasons! Doesn’t get any better! Tell Peggy to keep on cheering for the Vols. We’re not as good as we used to be, so a little help all the way across the country would be a good thing! Have fun at Burning Man!